A mostly late C13th church. Internal restoration undertaken in 1905-6 by CA Bassett-Smith. Parish Church. Dateable features are largely C13, and fabric seems largely a single build, though with several examples of Perpendicular work, and restoration work of 1906, conservative in character. Small rubble or cobble construction with ashlar dressings. Leaded nave roof, Welsh slate to chancel. West tower and spire, nave and chancel. Massive three stage tower on ashlar plinth, with angle buttresses. The stages are each recessed slightly. Lancet window to west, and in first stage, paired bell chamber lights with central shaft and plate tracery. 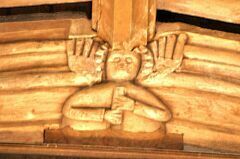 Corbel table above. Embattled parapet with thin angle pinnacles. Recessed spires with two tiers of lucarnes. South nave wall has renewed plate tracery light to south-west, simple chamfered arched doorway and two Early English windows, the intersecting tracery forming 2- and 3-lights, with hood moulds. Continuous sill band. Central buttress. Steep pitch of former nave roof visible in outline in east wall of tower. Buttressed chancel has plate tracery to south-west window and a Perpendicular window of 3 principal lights with small upper trefoiled lights in chamfered segmental head. East wall seems to be a rebuild and is mostly window: 5 lancets, c.1906. Steeply arched and chamfered priest's door to north and Perpendicular window of 2 principal lights with smaller upper lights. North nave windows are also Perpendicular, of 2 and 3 lights, set beneath a square-headed stilted hood mould. North porch added c.1906, the doorway has exaggerated ogivally arched head and chamfered jambs. The door itself may be C18 or C19 and consists of paired panelled doors. Inside, the restoration involved removal of all plasterwork in the 'scrape' tradition. Continuous triple chamfer to tower arch: the largest space beneath the tower substantial fragments of a C14 screen with moulded ribs and a dentilled rail above the lower panels, some of which have an applied tracery decoration. C16 balusters added. More panelling of C17 with turned balusters on west and north walls. 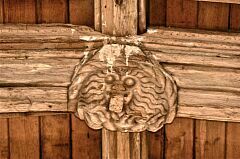 Nave roof is C15: a fine example of local woodcarving tradition. Shallow pitch with moulded tie beams, purlins and ridge piece. Each tie has central bosses carved exuberantly with grinning heads, heavy foliage etc. Screen wall to chancel and chancel arch are Victorian, so is the boarded wagon roof of the chancel. Tomb recess in north wall with wide shallow refoiled arch deeply moulded, with dogtooth hood mould. It is capped by a coat of arms. In front of it, but unrelated, a tomb chest of 1614. Alabaster, in memory of William Jervis and his two wives, Anne and Frances. The three figures are represented as incised effigies on the slab, which is heavily worked all over. The five children of Anne and William are represented on the base; carved as frontal figures, their proportions almost grotesquely distorted, but in very detailed rendering of costume etc. Behind this, to the east, is another tomb chest, from the same school, this is dated 1597, in memory of William and Catherine Jervis and they again appear richly detailed in continuous patterning incised on the slab. William lived to be 94, and fathered a great many children who again are represented as frontal figures on two sides of the base. Facing west, are two shrouded children flanking a male figure (perhaps the father or an elder son) and on the south side 4 boys, a man, 3 girls, a woman and two shrouded figures. Again the proportions are distorted but no detail is spared. To the south, a wall tomb only 4 years later than the latest of these but in vastly different style. Two ample figures kneel in a predella with an inscription recording their numerous virtues. They are William Jervis, d.1618 whom it commemorates, and Elizabeth his wife, who commissioned it. Fragments of medieval encaustic tiles in the chancel and of C14 stained glass in a north window; two angels play a harp and a trumpet. Stained glass to south nave window of 1907. Pulpit is of 1685, handsomely panelled with sounding board. Series of early C17 benches (one is dated 1604). The bench ends have concave triangular tops with finials and round-arched recessed panels with geometric ornamentation reminiscent of strapwork. 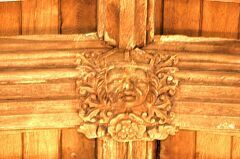 One is also carved with linenfold on its inner face. Two earlier and rougher benches survive at the west of the church. C13 font modified C19 by the addition of marble shafts to support massive undecorated basin. 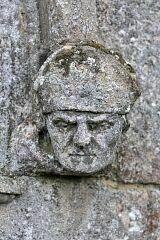 Project Gargoyle survey work in 2011 recorded ten 15th century roof bosses. 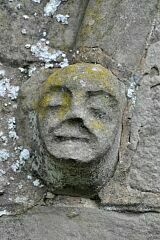 Some of the heads on the external elevations of the church may be from the 13th century but are more likely to date from the 1906 restoration. 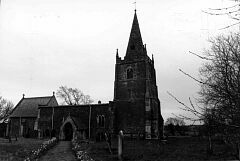 <1> Pevsner N, 1984, The Buildings of England Leicestershire and Rutland, p345-6 (Bibliographic reference). SLE4. "All Saints. Mostly late C13. W tower with angle buttresses, lancet windows, and a continuous triple chamfer in the arch towards the nave. Twin bell-openings with a dividing shaft and plate tracery. Battlements and pinnacles, and a short spire with two tiers of lucarnes. Their details also do not look later than 1300. 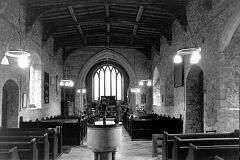 Nave with uncusped intersected and Y-tracery, shafted, with a continuous moulding inside. Also of the same date the chancel, though the windows are renewed, and one is Perpendicular. In the N wall a splendid recess with a large pointed-trefoiled arch, deeply moulded, on pairs of short shafts. 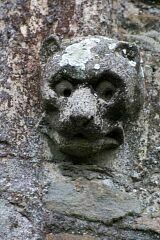 Hoodmould with a big dogtooth frieze. Perpendicular nave roof with bosses. The chancel roof is higher than that of the nave, which looks odd from outside (cf. Stoke Golding). The nave E wall and chancel arch by CA Bassett-Smith, 1905-6." <1> Bibliographic reference: Pevsner N. 1984. The Buildings of England Leicestershire and Rutland. p345-6.